This beautiful free-form swirl bar necklace in 14K gold from Apples of Jewelry is so unique and beautiful, you'll want to wear it every day! 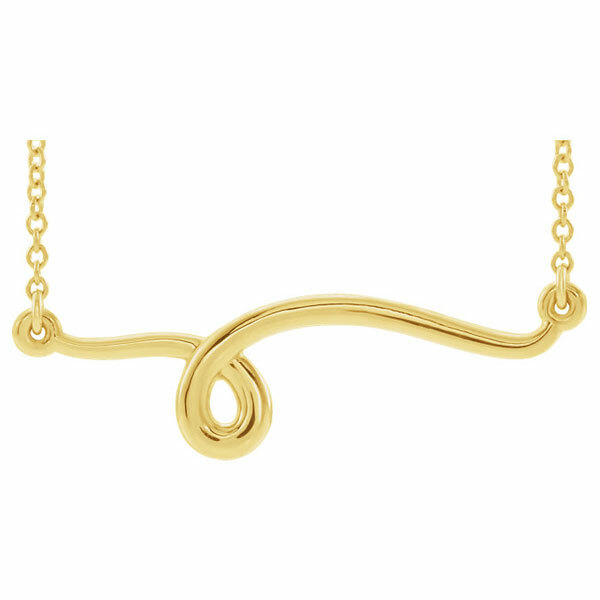 Made from 14K yellow gold, the bar pendant features a swirl a little off the center. The pendant measures 1 1/8" wide by 5/16" tall. On either side of the pendant is a hoop that attaches the pendant to the chain, which is a 1mm cable chain with a spring-ring closure. The chain is available in your choice of 16" or 18" length. We guarantee our Free-Form Swirl Bar Necklace in 14K Gold to be high quality, authentic jewelry, as described above. 14K White Gold Freeform Bar Swirl Necklace, 16" - 18"